I enjoyed a brief infatuation with this drink when I first became interested in the whole cocktail thing. Trying one now, I kind of remember why–it’s not a terribly complicated drink, flavorwise, but it’s not flat-out simple, either. Rather than using a sweetener to smooth out the tanginess of the lime, the Bronx Terrace uses dry vermouth, a flattening modifier that lends just enough complexity to keep the cocktail from being boring. I know little about the Bronx Terrace, other than it’s old–it appears in Patrick Gavin Duffy’s Standard Bartender’s Guide and in Harry Craddock’s Savoy Cocktail Book, both of which were first published in the early 1930s. It’s also a good drink for those times when you just need something different. 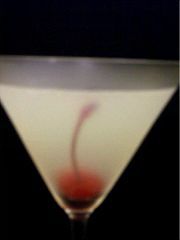 Shake with ice and strain into chilled cocktail glass; garnish with a cherry. I know this is an old post, but I thought I’d post a comment since I’m drinking one of these this evening. The Bronx Terrace is a drink I have to come back to every few months, and just a sip reminds me why. Or rather, makes me ask why, while it’s on my tongue, and remember as it finishes. If only I or someone could figure out how to make the first taste as complex and satisfying as the last remembrance of the sip, this drink would be truly exceptional. Good drink. I added a (very light) dash of both Cheery Heering and Maraschino to sub for the cherry. I think it added a bit of complexity and length to the drink. But thanks for the recipe, as you suggested, it is a change of pace.